Talk about transformation: about four years ago, the students at New Milford High School accused principal Eric Sheninger of “creating a jail” because he had banned technology from school. Over the next four years, Sheninger changed–and so did his school. New Milford High has become a spotlight example of how a public high school can foster a bring-your-own-devices policy–and support social media–all while increasing student achievement. 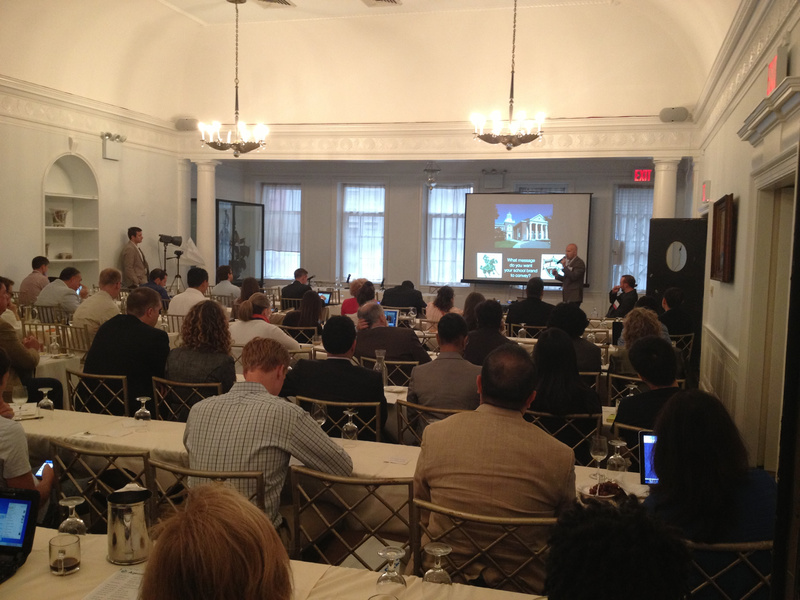 Sheninger was the morning keynote speaker at the 2013 Education Technology Innovation Summit (ETIS), a first time event in New York City that took place on July 25, 2013. It was organized by Mindgrub, a mobile, web and design tech company founded in 2002 by former teacher, Todd Marks. It wasn’t a huge meeting–probably 100 attendees in all–but the themes that resonated through the sessions illustrated many of the tensions and opportunities in the interplay of tech and education. Even though the event was held in New York, it had a decidedly Cheasapeake flavor: Baltimore has a growing hive of education technology activity, noted Dan Cohen, chief operations officer at Mindgrub, who helped organize the meeting. Among the Baltimore groups spotlighted at ETIS: Digital Harbor Foundation, Allovue, Unbound Concepts, An Estuary, LessonCast, the Baltimore SEED School and Connections Academy. The Economic Alliance of Greater Baltimore, a key sponsor for the event, has also recently been focusing its efforts on showcasing the Baltimore edtech community. The “Building an Edtech Ecosystem” panel–all women—addressed the complexities and challenges of building an edtech ecosystem both within and between the Baltimore and New York City communities. I moderated a panel with Heather Gilchrist (Socratic Labs), Katie Palenscar (Unbound Concepts), Jess Gartner (Allovue), and Erica Gruen (Quantum Media) around the networks and relationships with schools and investors needed for edtech companies to survive. The panelists agreed that edtech companies need longer runways, strategic partnerships, and relationships with educators to be successful. They all also recognized the importance of “de-risking” the process of partnering with edtech startups. As Gilchrist noted schools aren’t just afraid startups will fail. They also fear that the startups will succeed–and pivot into a new direction. Schools need confidence that a startup won’t radically change direction just after teachers and students invest their time in understanding how to use the product. Startup Goals: Make Money or a Difference? Particularly as edtech has become seen as a “hot” market, tension has grown thicker between those who want to make money and those trying to solve a real problem in education. During the “Edtech Startup” panel, one panelist suggested looking at the top ten companies that acquired companies last year as inspiration for future startups. Others begged to differ: Sarah Hall, CEO of Harley & Co, countered that there’s a place in the market for edtech companies that are not focused on being acquired and are building a viable business that solves a real problem in education. Conference attendee Christopher Will, a senior VP of Jones and Bartlett Learning, cautioned companies seeking an acquirer that they must “make sure that they’re adding value to whatever problems are being faced.” As more edtech companies flood the market, will schools take a company’s motivation into consideration during their partnering and purchasing decisions? Haves and Have-Nots: Do Startups Need Educators on Their Teams? Should every edtech company have a teacher on board? The panel split between the haves- and have-nots: Everyone acknowledged that “connecting” to educators is crucial. But the companies without embedded educators felt they could achieve this through relationships with educator networks. The two panelists with educators on their founding teams argued that it was vital to have an educator voice at a high level of decision making. While not explicitly stated, the kind of product clearly makes a difference in terms of how nuanced an understanding is needed for a company to be successful in the education market. How to “reach” educators was also hotly debated. “Educators are not interested in sales tricks,” noted conference attendee, Adam Aronson. “Solve their problem and they will be interested.” Read Ben Stern’s piece for more tips on pitching technology to schools. While mobile technology serves an increasingly more important role in education, sometimes it is simply not the best tool, panelists noted. Many classrooms still lack wifi access or sufficient bandwidth. For mobile tech to be successful, argued the panel, it must be available offline, cloud-based when online, social and connected to data. Much as we’ve designed amazing bicycles, observed Michael Lindsay, founder of Three Ring, sometimes it still makes more sense to walk. The “Professional Development” panelists stressed how broken the current model is: the current one-shot workshop model rarely changes teacher practices and minimal funds exist for sustained, ongoing PD. Each panelist is addressing PD issues from different angles: TeachBoost CEO Jason DeRoner focused on the need for ongoing dialogue among teachers and administrators, not just one-time evaluations. LessonCast founder Nicole Tucker Smith advocates professional learning that is condensed, job-embedded and just-in-time. Shelly Blake-Plock wants to shift the paradigm so that teachers are “developing the profession,” not simply receiving professional development. Andrew Coy, Executive Director of the Digital Harbor Foundation, focused his afternoon keynote on supporting students becoming technologists, not just consumers of tech. “What students can create is often better for society than what we can buy,” he says, and offers an impressive example: two Digital Harbor students recently spent eight days creating their own 3-D printer. Yes, these students built their own printer. If students can build their own 3D printers, imagine what else they can do! Where do edtech entrepreneurs–many of whom are former educators– find support as they navigate the ups and downs of building a company? I posed this question to my panel at ETIS 2013, “Building an Edtech Ecosystem.” It really could have been titled “Women to Watch in Edtech” or “Women ‘Leaning In’ to Edtech.” Joining me were Katie Palenscar, (founder and CEO of Unbound Concepts, an edtech startup and graduate from Accelerate Baltimore and Socratic Labs), Jess Gartner (founder and CEO of Allovue, which also came out of Accelerate Baltimore), Heather Gilchrist (partner and program director at Socratic Labs), and Erica Gruen (principal at Quantum Media). Each panelist shared the classic story of experiencing a pain point in her classroom and wanting to fix it. That was just the first step. Often, having mentors and seeing examples of other edupreneurs have helped educators realize that they could build a solution–and even a company. That’s what happened to Gartner, who shared that seeing Katie Palenscar launch Unbound Concepts in the spring of 2012 inspired her to start her own company to tackle the problem of school resource allocation. And now that multiple schools signed up for her service, Gartner is the success story–and she tries to return the favor by mentoring like-minded entrepreneurs through the complexities of founding a company. Gilchrist is “leaning in,” too, and lending a helping hand. Through her work at Socratic Labs, an incubator for edtech startups, Gilchrist shares her experiences from her previous experience at Grockit, a test prep startup. Gilchrist isn’t content to support just the local NYC community, either. She spearheaded Socratic Labs’ Edtech Passport program, which seeks to connect human and capital resources in edtech ecosystems in New Orleans and the San Francisco Bay Area. Even teachers who have left the field years ago often want to remain connected to education. Gruen represents a different and important aspect of the edtech community member by serving as an angel investor and advisor to startups. Beginning her career as a language arts teacher, curriculum developer, and education psychologist, Gruen shifted to entertainment, taking over The Food Network and selling it, after which she launched and sold Bravo. She now serves as a mentor for Socratic Lab (as well as an angel investor in Unbound Concepts), where she advises edtech startups on marketing and business strategies. As these entrepreneurs blaze their own trails, they are simultaneously reaching back to show others the way, creating a network of support and resources. Palenscar mentioned that all of her fellow panelists have one another on speed dial; each has answered urgent text messages in the wee hours of the night. Founding an edtech company, they pointed out, is much more possible with the support of like-minded people who are passionate about changing education, and who remind you that you are, truly, the best person to solve the problem. Whoa! 1,073 tweets, from 119 people over the course of an hour! That’s a virtual fire hose of information. On Monday, people gathered (virtually) re #edtechchat to share tips, best practices (and even a few warnings) about how to choose technology. Moderator Katrina Stevens has pulled a handful of the comments. Feel free to explore the online archive of the whole chat for more details. Even better: the group will be at it again next Monday evening (8pm ET; 5pm PT) Join in! How do you choose edtech tools? @harrell_art The learner is the center. Use technology as a tool to engage the learner rather than the focus. @SrtaLisa The learning goal still needs to drive the lesson. Must consider if tech helps or complicates that. Sometimes you have to be the guinea pig & be the first teacher in your school to try edtech tools. Someone has to be first. @Jepson you need #edtech that ENHANCES your curriculum, your teaching, and students…not dominates. @SaneeBell Tools are like shoes. Not all tools will fit every teacher and every classroom. @hparcher Ts need to realize engaging with tech is no longer optional. Ss need skills & 2 become dig. citzns. Who else will model that? @ryanhorne0076 Qs to ask: how much PD is required? what’s real cost of tool? Is it “beta”? How much experimentation do u like? @hparcher Do we want kids learning Digital Citizenship on the back of the bus or in a classroom with a qualified teacher? We need to devote more, small group, teacher-led PD to integration of good edtech tools. Share lessons that work. @engtechwriter Beware the sheen of something new. Not all that glitters is good. Seek to see it in action in your room. @ShawnCRubin I hate free that isn’t free! Don’t say free if you only give me enough to test product. Be clear that free is not usable! In my dream world there is a room at school where Ts can practice tech on each other, and try things out. @s_bearden: As a tech director I like to know about different tools so I can support tchers interested in using them. I almost moved to Silicon Valley but decided to remain in Baltimore because I believe it has real potential to become an EdTech Hub. Why? In addition to truly inexpensive housing, Baltimore has a quirky spirit that believes it can do anything. Baltimore is also home to strong community movements, as well as a whole range of meetups and events for the tech and even edtech community. The model for the Digital Harbor Foundation has real potential for replication in other regions. Tom Vander Ark’s comments on his recent visit to Baltimore confirm Baltimore’s rising stardom. But we could go further, become more. Here are some beginning thoughts on steps we could take to put Baltimore on the edtech map. I’ve been circulating this the past few weeks, so many of these ideas are coming out of conversations with local edtech companies, local investors, and community organizations. This is an attempt to organize and open up the conversation. Looking for feedback! Sylvan, Laureate, Learn It, Calvert Education Services, Prometric, and MoodleRooms, creates a strong tradition of education technology in the region. How might the edtech community grow if some of these stalwart companies reached out to provide mentoring? What might more established companies learn from startups? Organizing an annual event that brings together edtech startups with educators could strengthen the connections between edtech and the education community, as well as bring attention to Baltimore. Chicago recently hosted an event, for example, that drew over 600 people, including around 450 educators, and provided opportunities for young edtech companies to showcase their tools and to interact directly with teachers and administrators. Most of Baltimore’s edtech companies cannot afford to pay the high fees associated with market research reports to provide them the data they need to make better decisions. Edtech companies coming out of places like Imagine K12, for example, frequently have access to these kinds of reports. It would be helpful if a local entity, a government organization is a logical choice, provided access to education reports, similar to the way the local biomedical community has access. A matchmaking broker could facilitate connections between schools and edtech startups. This role could help streamline the process for helping startups find the right school partners. Working with Baltimore City and Baltimore County Public Schools, we could identify a dozen or so schools that are willing to partner with edtech companies. Those schools would understand what is expected from them and what they will receive in return. Startups would understand the process for engaging and partnering with schools. They are afraid that a startup could disappear or pivot after the school has invested time in the product. Losing instruction time has significant consequences, so educators are protective. Stakes are high for students and educators. If something does not work, principals have to explain why they chose an untested product or service. If a district understands that a set of schools has been identified to try edtech innovations, less risk exists for those schools. Schools need to trust that the adults who enter their buildings have the best interests of their students in mind. Ideally, this school district broker should not be limited only to startups coming out of particular accelerators or other programs. Any legitimate edtech startup should be considered. There is also no reason why the Baltimore Edtech scene cannot partner with other school districts beyond the city and county. Stanford feeds the Palo Alto tech community in similar ways that Boston universities feed its tech community. The Baltimore region has many high-caliber schools that would make excellent partners in developing an edtech pipeline of talent as well as providing research partners. Public education stresses the importance of only using research-based programs, and we have a number of universities known for research. We just need to make the connections. MICA offers intriguing possibilities, especially with its recent branching out into new design and business programs. Talented user experience (UX) folks are difficult to find and yet the user experience is crucial to developing a successful edtech product. Partnering with MICA could lead to a significant design talent pipeline. If Baltimore were to establish itself as an edtech hub that truly understands UX, talent and money could flow to Baltimore. University of Maryland at Baltimore County also has several established digital design programs. With Presidential Scholar Dr. Nancy Grasmick making Towson University (TU) a leader in teacher education, Vince Talbert on the TU Board of Visitors, and Frank Bonsal, Jr., of New Markets Venture Partners and Bonsal Capital, serving as interim director of the TowsonGlobal Business Incubator, Towson has real potential for supporting the edtech ecosystem. Johns Hopkins University and Loyola University are other obvious potential partners, as well as many other strong institutions in the region. Expanding the region beyond Baltimore City opens up possibilities. The San Francisco scene really extends through Palo Alto, Mountain View, and even down to San Jose. By narrowing our vision of Baltimore edtech simply to the city, we are potentially limiting our potential base, making it harder to compete with established and burgeoning communities. Even if we simply developed more relationships between Baltimore City and Baltimore County, we could position ourselves more strongly. Expanding beyond Baltimore is also definitely worth a conversation about the advantages we could gain from a broader base. Creating a paid internship program could bring much-needed talent to Baltimore. Baltimore’s inexpensive housing and downtown scene, as well as supportive edtech community, will help keep them. Many individuals and organizations appear to be invested in moving Baltimore’s edtech community forward. For example, while the Emerging Technologies Center (ETC) is not strictly focused on edtech, the ETC is nurturing an edtech cluster whose CEO’s meet regularly to learn from one another and to strategize how to foster Baltimore’s edtech ecosystem. 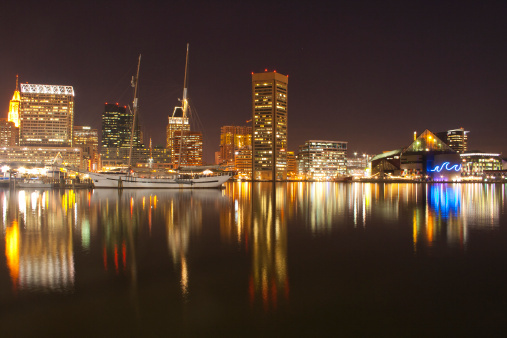 The Economic Alliance of Greater Baltimore recently released a market research report on the potential for Baltimore to become an edtech hub, as well as hosted an initial discussion about how to move Baltimore forward. The Maryland Incubator Company of the Year Awards recently added edtech as its own category. Clearly there is a growing awareness of the potential for our community. How might we consolidate community efforts to be more effective? To truly put Baltimore on the map, we all need to work collaboratively. Simply put, more seed money investing in Baltimore edtech is necessary for the region to grow. In addition, while there is a small group of local investors who have an appreciation of the complexities of edtech, helping a larger pool of investors understand the industry could expand investments. Are there ways to be more innovative with foundation funding models? For example, the Abell Foundation has funded betas within the Baltimore City schools, providing nondilutive capital to help edtech startups. Hunt Valley is one of the four big hubs (San Francisco, Boston, Austin) for the gaming industry, and gamification continues to be a trend in education. Can we tap into the local gaming community before they all exit the region? The maker community also has a strong presence here that could partner with edtech development. Many established education companies have resources to influence policy decisions; small edtech companies do not have these kinds of resources or access. Is there a way to pull resources or create a forum that could influence policy to be more beneficial to edtech companies? This is what edtech should be: teachers, administrators, and even students, and edupreneurs participating in the same conversation. On Thursday, July 11, hundreds of teachers and administrators from public, private and charter schools from the Chicago region spent a day of their free time learning more about the 30 edtech startups and trying out their products. The beautiful, light-filled Harold Washington Library, imbued with a long history of spreading knowledge for all, provided the perfect backdrop for these lively interactions. The brainchild of Eileen Murphy, former teacher, curriculum developer, and district-level administrator for Chicago Public Schools and now founder and CEO of ThinkCERCA, the Education Technology Startup Collaborative User Conference facilitated many informal interactions among tech-savvy educators and startup teams building the tools. Samuel Dyson, Director of Hive Chicago Learning Network, masterfully kicked off the event with a rally call: “learning as a lifestyle,” which many teachers took to heart as they volunteered a summer vacation day to learning from and helping entrepreneurs. Chris Liang-Vergara, Chicago native and Director of Instructional Technology for Personalized Learning at FirstLine Schools, opened his keynote with a quote from John Dewey, squarely reminding participants that the focus is on education and not the technology. In both his opening and comments during the closing panel, Liang-Vergara emphasized that educators should first identify what they hope to achieve or the problem they want to solve, then determine the best tools to use–and not the other way around. “If the technology fits, make it fit. But don’t force it to if it doesn’t.” Liang-Vergara also asserted that the feedback loop between education technology and the educators using them is fundamental to the future of education. The takeaway message of the day: educators recognizing that they have a crucial voice in the development of technology tools that meet their needs. With so many of the edtech startup teams founded by former educators, it became even more apparent that teachers have the ability to identify their needs and participate in finding and creating solutions. Not all teachers can or should become edupreneurs, but all can play a critical role in the conversations about how to develop and implement the best tools to support student learning. As Liang-Vergara reiterated, we are “entering an era where digital tools can enable teachers to guide children through curricula and experiences unlike ever before.” He used an analogy of maps to illustrate his point about the important role of teachers. Map directions are suggestions, he said, but only an educator knows best on how to guide students through a journey of self-exploration. Discussions are already underway for similar events to be held in the SF Bay Area and in Baltimore. This user conference may be signaling a shift in edtech conferences altogether. Oh, the pressure. Amid all the hubbub of ISTE, startup teams pitched themselves. Twenty teams were winnowed down to six for Wednesday’s final round:Citelighter, LearnZillion, LivingTree, Scrible, UClass, and Zondle. Participants were given five minutes to pitch and three minutes to respond to questions from the judges. The five judges included EdSurge’s contributing writer, Katrina Stevens, industry expert Steve Hargadon, Pearson’s Tom Hall, HP’s Jeannette Weisschuh, and Richard Culatta, Acting Director, Office of Educational Technology, U.S. Department of Education. (Judges receive no compensation for taking part in the competition.) The event was organized by UK-based Edmix. LearnZillion continues to be both a crowd pleaser and judge favorite. This startup’s teacher-led team is building its foundation on the recognition that teachers need and want job-embedded, content-focused PD, especially as schools prepare for the Common Core. Its Professional Learning in the Learning Profession Status Report, a must read for anyone working on professional development (especially the Key Findings on page 5), stresses the importance of just this kind of sustained professional development directly related to practice. As LearnZillion adds to its current stack of 5,000 lessons and creates 300 new tutorials and short PD videos, it will need to continue to work hard to maintain the high quality of each lesson to avoid the curation and quality control issues that have plagued many lesson planning and professional development startups. Content creation is difficult, time consuming, and requires significant domain expertise; it’s also immensely critical and will impact student learning significantly. LearnZillion’s model of using a combination of master teachers and tight quality controls seems to be working. Along with the usual questions from the judges focused around revenue and business models, the Dept. of Ed’s Richard Culatta pushed many of the teams to clarify exactly what data was being collected and how it was being used to improve student learning. Edtech startups will likely continue to face questions about the security of the data they capture, as well as how that data specifically drives student learning. Jane McGonigal likes to make history–and figured that was a great to way to jump start ISTE13. So she did. McGonigal closed her ISTE13 keynote with a massive multiplayer thumb-wrestling match, a striking strategy for reinforcing her main points about the benefits and potential of gaming. The whole audience was fully engaged, curious, collaborating, feeling connected, and almost joyful. Participants felt like they were part of a larger “lofty” goal of beating a world record–albeit for thumb wrestling, having fun, and thinking creatively about strategy, all elements present when playing online games. Plus, it pulled everybody off their chairs, moving, and away from multitasking on digital devices. Yes, even the bloggers put down their tablets and phones. McGonigal claims we collectively spend 3 million minutes every day playing Angry Birds, and that most college students spend more time playing video games than they spend on classwork. (One alarming statistic shared by McGonigal: over 92% of American 2-year-olds play video games!) She even showed a scan of the brain, indicating what parts of the brain light up when people either play–or just watch–games. (See above picture). Imagine what could be accomplished if this intense energy shifted to another purpose. McGonigal suggests that Urgent Revoke, a massive online multiplayer game does just this; participants solve world problems such as world hunger, for example. Teachers and organizations can request free access. McGonigal’s research shows that gamers spend 80% of their time failing, which, though counterintuitive, makes them want to continue to play the game. At an earlier ISTE Ignite session, Kill Off the Players, one presenter essentially made the same point: Gamers like games that kill off their players; the challenge of figuring out how to make it to the next level pulls them back to the game. The speaker suggested that when games prompt players with too many hints, players become less interested in continuing to play, not more so. The lesson for education is direct: Give students too many of the answers before they solve problems on their own and we stifle their energy, too. Instead, educators need to help students recognize that failure is part of the process towards success. Games may nothold the answer to solving our problems in education but it’s hard to argue against wanting students to experience the same emotions every day at school that they do when playing games. Shouldn’t students be fully engaged, collaborating, thinking critically, and working towards a goal larger than themselves? Dare we also mention that school should be fun, challenging, and rewarding? Would You Rather Go to Hogwarts or Hop On the Magic School Bus? Over the past few years, thousands of people have had the thrill of trying to start a company in a weekend, thanks to Startup Weekend workshops. But you want a serious challenge? Try redesigning a school. Last weekend (June 7-9), some 130 people bravely rose to the task during the very first SF Startup Weekend EDU: NextGen Schools. Organized by Silicon Schools Fund founder, Brian Greenberg, the weekend was designed to capture all the frenetic energy associated with startups and pour it into reimagining schools. “It’s easy to recognize that the factory model of education is broken–it’s far scarier to imagine and build next generation schools,” declared opening speaker, Alex Hernandez, a partner at the Charter School Growth Fund. EduHub, where startups and other organizations co-share a school building to encourage more mentorship opportunities. These three school models won 1st, 2nd and 3rd place respectively in Sunday night’s final pitch competition. EPIC, led by Hae-Sin Thomas, CEO of Education for Change Public Schools, aims to “reframe the narrative within the middle school to make it more compelling than the current narrative in the streets in East Oakland.” According to the design, students would be placed into four competitive “houses,” Harry Potter style, that compete against each other. Individual student achievement helps the whole house, building in incentive for students to help another. Students would be defined not by grade levels but by their placement along a 12-level mastery continuum for each content area. In addition, at the end of each six-week block, all students get to adopt a persona and then set out on competitive quests that could take them all over the city. Common themes emerged among the pitches and presentations: personalized, authentic, and project-based learning, less rigid school structures, more community and parent involvement, peer-to-peer learning, a focus on perseverance and problem-solving, developing entrepreneurial skills, and generally connecting deeper learning to the real world. In reality, few would argue these approaches aren’t great for students, so why aren’t we already doing these in schools? Real innovation emerges in design and execution. It’s easy to posit creative ideas for school reform, but hard to implement and sustain innovation. These weekend teams first refined their core innovation before coaches pushed them to building out a full school model around these innovations based a budget of $7500 per student. You want to build a school with project-based learning? What does that look like and how much does that cost? The weekend buzzed with energy and the creative juices flowed right along with the higher-than-usual amounts of caffeine. Mandela Schumaker-Hodge, emcee extraordinaire, founder of Tioki, and winner of the first Startup Weekend EDU back in 2011 kept the energy high with her inspirational quotes and short “dance party intervals.” Chapman Snowden, co-founder of Hack Year, artfully organized the whole event with the help of Christine Ortiz and Jon Skolnick. Even existing schools wanted to take advantage of the inspiring, incubator-like environment to revise some aspect of their school design. For example, four members of the San Carlos School District, including Superintendent Dr. Craig Baker, spent the weekend delving into how to take the next steps in moving their schools forward. Educators crave spaces where they can collaborate and innovate. The experiential learning aspect of Startup Weekend events are pure gold: as teams develop their ideas, they model authentic learning in a real world context. Because Silicon Schools Fund and Charter School Growth Fund shared that they are looking for new school models to fund, the context for the weekend could not have been more real or more authentic. The top two teams, EPIC and The Real Magic School Bus, won support to attend 4.0 Schools Essentials in New Orleans to hone their concepts as well as opportunities to pitch their ideas to Silicon Schools Fund, the Charter School Growth Fund and several superintendents and charter school leaders. These schools could really happen—in fact, it would be surprising if we didn’t see some version of each of the winners launch within two years’ time. One unexpected prize? Dr. Vincent Matthews, judge and Superintendent of San Jose Unified School District, was so enamored with 3rd place winner EduHub’s idea of bringing startups and organizations into a school that he asked them to visit him to to discuss how they might roll out EduHub in one of his district schools. That’s pure and sweet validation. Indeed–among Startup Weekends, SF Next Gen Schools Weekend didn’t just check the box but zoomed straight up the curve to mastery! I’ve been wrestling with what would work as an American collective narrative, what could unite us in investing and supporting public education the way we should. The Finnish people appear to agree collectively on a narrative of equity, for example. Turning the mirror back on the United States, we’d like to believe that Americans could gather around this same call of equity. In reality though Americans prefer a narrative of meritocracy. We tell rags-to-rich stories of folks such as Bill Gates, for example. This so-called poor man who came from nothing and built an empire attended one of the most privileged boarding schools in the nation; the college he dropped out of was a small university — Harvard. Gates had access to a computer when few people even really knew what computers were. The reality of his narrative is really one of privilege, connections, and access. So, what might be a narrative Americans could rally around? I’ve come to believe that perhaps personalization is the answer. Somewhat tied to the American focus on meritocracy is our country’s rich history of “rugged individualism,” which includes a sense that we’re all unique. Current parents certainly want to see each of their children as “special,” so parents often support efforts to a tailored approach to education. In stark contrast to Finland’s largely homogenous society, America must educate a wide range of students, making it even more important to find ways to personalize learning pathways. As teachers and administrators, we seem to be moving on a trajectory toward personalization: differentiation, Universal Design for Learning, emerging technologies, competency based education, and advances in education technology make personalization of learning more possible. Differentiation: In many ways, the shift toward differentiation was a first step towards personalized learning. Though differentiation clearly doesn’t always happen in every classroom, at least there’s more consensus that this is how we should be teaching, if we’re to reach students who have a wide range of readiness, backgrounds, interests and skills. 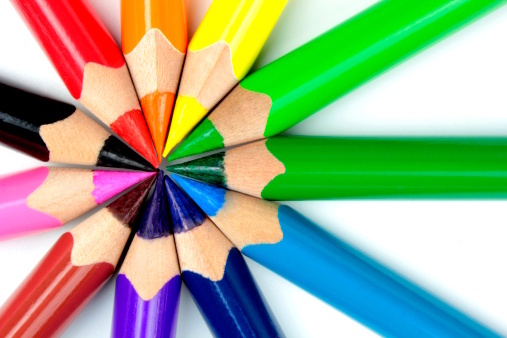 Universal Design for Learning (UDL): UDL takes differentiation even further and is becoming increasingly more recognized as the ideal approach. In Maryland, for example, all curriculum and implementation must follow UDL principles, as mandated by recently passed state law. When we design and implement curriculum that meets the needs of students who have historically been on the margins, we’re also better meeting needs of those students who fall in the center. Adding features such as larger print, audio, embedded vocabulary, etc., allows teachers and students to personalize the learning experience further to meet individual needs. Cultural Responsiveness: As our curriculum and instructional practices become more culturally responsive, we’re adding another layer of personalization. Students connect to material when it feels relevant to them and is presented in formats that are engaging and reflect their own realities. It feels more personal. Competency-Based or Standards-Based Education: The shift from seat time to competency-based education allows us to embrace personalization more deeply. With mastery as the goal, we can personalize student pathways, recognizing that some students need more time to master material and that some students need gaps filled or are able to accelerate through material. Emerging Technologies: Advances in educational technology are making personalization more possible on a larger scale. For example, formative assessment engines are getting better at identifying student gaps and strengths, including attitudinal information. Teachers and students can learn more about the students as learners and what works best for them. More publishers are also developing digital curricular resources that have different reading levels, including resources for ELL. When Amplify launched its new product at SXSW EDU, everyone was excited about the platform’s capabilities of allowing teachers to identify student needs quickly through digital formative assessments that recommended personalized assignments for different groups of students. Other competing products will continue to enter the market. Blending Learning: With more blended learning options available, we’re able to offer students additional course options, allowing us to personalize student courses of study. Each student can pursue an individual personalized set of courses, despite the capacity of teachers in a building. World languages, AP courses, and other electives are excellent examples: students can pursue Chinese, for example, even if there is no Chinese language teacher at a building. Schools can offer upper-level courses, even if there are only a handful of students who need those courses. If a student is passionate about a subject not offered, schools can arrange to find a course that meets that student’s needs. In the end, it’s most often the relationship between a teacher and student that impacts student achievement. One of the most powerful elements of a move towards personalization is that students will feel increasingly more that their teachers really understand and are meeting their needs. When students feel that someone cares about them, they begin to care more about what they’re learning. All of these approaches and tools support teachers in personalizing learning experiences for their students. Click here to read on Edsurge.com. 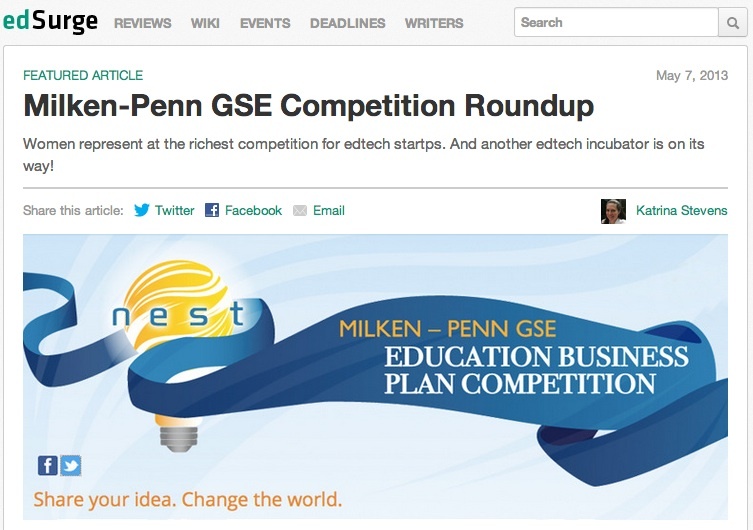 Women dominated at this year’s Milken-Penn GSE Business Plan Competition summit in Philadelphia. For starters, the event was the first one led by executive director of academic innovation, Barbara “Bobbi” Kurshan, formerly the executive director of nonprofit Curriki. Kurshan knows what entrepreneurs want–funds and networking support–but is aiming to provide those carrots in an atmosphere that stresses the importance of academic research. On Wednesday morning, Kurshan planned to unveil what she calls an “Education Design Studio Fund” (EDSF) program, a sort of edtech incubator and investment fund that is built on collaboration between Penn GSE, several corporate supporters and a host of venture capitalists. The EDSF plans to soon start accepting applications for a cohort slated to begin August 1. Each finalist had about 15 minutes to present and answer Q&A, a welcome change of pace from the 3-minute “elevator” pitches that often dominate such events. Many finalists are trying to break into increasingly crowded spaces. For example, the judges immediately asked Scrible how it differentiated itself from competitors like Evernote, EasyBib and Citelighter (a Day 2 panelist). Scrible’s Victor Karkar contended that his service’s annotation features and execution distinguish the product from others. Edfolio, a startup that aims to have a beta out in a few weeks, directs job candidates to recommended courses to fill in skill gaps for the jobs they want and then connects them to potential employers–another crowded, albeit needed, service offering. Gingkotree, which launched its beta in October 2012, allows instructors to build online curriculum from any resource–either OER or not–complete with automated copyright clearance and digital sourcing. Two finalists tackled attrition in different ways: Persistence Plus “nudges” students to do what it takes to get through school (think WeightWatchers meets your homework). AspirEDU takes an approach like online risk credit analysis, crunching through data on online students to create a red-green-yellow light signal on which students aren’t meeting expectations so counselors can reach out quickly. AspirEDU’s main challenge may be how to prevent other companies from simply adding a similar algorithm to existing products. In a panel discussion, RenaissanceLearning founder, Jack Lynch, argued that successful edtech companies focus on a narrow pain point and provide a pragmatic solution. Similarly ImagineK12 founder Geoff Ralston advocates founders focusing on something they care about passionately and then building. Autism Expressed appears to fit these descriptions. Michelle Keone has developed a truly unique program that teaches social media literacy to students with autism, helping them learn to use digital tools. Autism Expressed’s curriculum could easily be adjusted to help ELL students learn similar skills, she proposed. When Marjan Ghara invited her two BiblioNasium “cofounders,” her two elementary school children, on stage with her, Ghara’s son explained that when he gets more Biblio prizes than his friends, he can brag about how many books he’s read. BiblioNasium, which has been a hit with librarians, appears to be filling a particular need for a COPPA-compliant, safe space to crowdsource reading recommendations for K8. If awarded funds, BYKids plans to develop curriculum around the four student-created films they’ve produced over the past five years. BYkids want to bring a global perspective to American classrooms through videos produced by children in other parts of the world. Raise Labs, a company that got its start in the ImagineK12 accelerator, has raised $30 million that it aims to award in micro-scholarships to students throughout their high school years to both motivate them to get through school and to help them pay for college. UpSkill Capital is launching a pilot in India where they will lend workers relatively small amounts of money for job training that will increase their earnings six fold within six months. Even as ImagineK12 cofounder Geoff Ralston has seen a surge in capital for edtech, for example, he isn’t certain how long it will last. Connections Education cofounder, Mickey Revenaugh, who was beamed into the Philadelphia conference from her spot on stage at the ongoing San Francisco SIIA conference, argued that the real fragility in the ecosystem is less about edtech and really about how fragile our schools are both individually and collectively. Torch Lytle, former Trenton Public Schools superintendent and current faculty at Penn GSE, believes we’re in the process of “de-schooling schooling,” moving away from traditional diplomas and degrees towards a set of badges that represent competencies. Lord David Puttnam, Chancellor of the UK Open University, who also beamed in via a video conference link from the UK, described how he feels the education world is at a significant inflection point. He pointed to the skyrocketing usage of Britain’s TES, a site where teachers are sharing and seeking lessons. (TES is affiliated in the US with ShareMyLesson.) Some 84% of UK teachers downloaded resources from TES last year, he said. And just last year, teachers (from the UK and elsewhere) used 130 million TES resources, he added. Raise Labs (Preston Silverman and George Kirkland/San Francisco, Imagine K12 alumni) won the Milken Family Foundation First Prize ($25,000), the Startl Prize for Open Educational Resources ($25,000) and the K12 Prize for Online Learning in Grades K-12 ($25,000). Persistence Plus (Jill Frankfort and Dr. Kenny Salim/Boston) won both the Milken Family Foundation Second Prize ($15,000) as well as the American Public University System Prize for Innovation in Online Education ($25,000). Two of the judges also said they would contribute $10,000 to sponsor Indian students served by UpSkill Capital.